Alongside the countless playlists and articles that have made up our week-long celebration of the life of Jimi Hendrix, we've also posted a few more personal essays. When interviewing such guitar heavyweights such as Steve Vai and Eric Johnson about Hendrix, we also asked them to answer the question: 'What does Jimi Hendrix mean to you?'. The resulting essays we got back were fantastic and, in the case of Jimi's sister Janie, revealed a side rarely found in articles on music-making websites - read Janie's touching tribute to her late brother here. We also asked the question to our various communities on Facebook, Twitter and here on MusicRadar - you can find the best of the tributes here or just sign up and you'll find that the tributes are still pouring in. So before our reader poll of your top 10 greatest Hendrix songs ever lands (UPDATE: Click here for the results! ), we'll turn our last 'What Jimi Hendrix means to me' spotlight onto Joe Hrano. Young Joe was the latest of our talented army of unbelievably young MusicRadar interns and one who, when asked what music he was into, didn't reply Foals, Florence or Foo Fighters but "ROCK!" - and Hendrix in particular. And so what better way to show that Hendrix isn't just for old hairy rockers but for the teenagers who represent the future of music than to ask one of them? 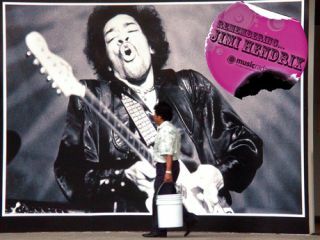 Hey, Joe - what does Jimi Hendrix mean to you? Joe: "My first memory of Jimi Hendrix was in the late Nineties, when I would have been around eight years old [See what I mean? - Ed]. My dad had me momentarily caged in my living room and I was under the impression that I was going to have some dadrock inflicted upon me. "Whilst jamming Are You Experienced into the CD player, my dad told me that who I was about to be lending my ears to was widely considered 'the greatest guitar player in history'. I sighed and waited for the dadrock to begin, preparing myself for looming boredom. "As Foxy Lady's flickering first moments rose from the silence, sounds unknown bundled themselves into my young head. This was not a shrill girl band of the time. This was not Puff Daddy. This was different. "By the chorus, I was intrigued. By the end of the track, I was hooked. After only a few tracks, I somehow realised that these sounds were important, a connection developed from nothing more than the superficial mention of a gun and of "a woman" somehow being "shot down". Possibly not the ideal soundtrack to cap-revolver adventures and Action Man roleplay but, as I say, important. "That immature appreciation of Hendrix's music was lost for several years, only to return as I hit my teenage years and music REALLY started to mean something. My growing interest in 'old music' lead me to search the internet for video clips and information on the songs of yesteryear, and Hendrix was the first I explored in-depth. "Discovering performances such as the above for the first time both saddened and astounded me. As disappointed as I was to know I would never be able to see Hendrix live, I was and still am gripped by his detailed and decorative use of guitar alongside unwavering vocal strength. I quickly realised that instruments need not be secondary to vocals, but that they can go further to become a separate method of expression alongside them. So I picked up a guitar myself. "My journey into Jimi was far from over, and soon all of my dad's Hendrix records had been removed from his shelves and piled into my room. Before long, my MP3 player was littered with songs from decades gone by. "Away went the 'Now…' compilations and even the Bloc Party and Queens of the Stone Age albums to be replaced by new - well, to me - albums by Led Zeppelin, The Beatles and Bob Dylan. My musical awareness was flourishing daily but all the time Hendrix sat smugly at the top of my '25 Most Played Playlist'. "For a teenager in the 21st century - a time when sensibilities take predominance and the cultural revolution of the late '60s appears to be a prehistoric recollection etched by music, movies and memory alone - music from the '60s and '70s represents liberation and freedom from a square, inhibited society that we seem to be hurtling back towards nowadays. "For me, Hendrix was an arbiter of this social change and his compositions portray the energy and voice of the '60s, a rejection of moral overtones and a warm welcome to a new, widespread tolerance of music, drugs and sexuality. This freedom is clear in Ezy Ryder. Its rolling riff, many movements plus that screaming solo mark this as one of my favourite songs not only of Hendrix's, but of all time. "I find a sensation of submergence when listening to Jimi's songs that I rarely find in today's music. Each song was not conceived to be a mere money-making accompaniment to the pace of everyday life, as a great deal of the shallow, Auto-Tuned and seemingly generic creations that pass for popular music nowadays seem to be. "Instead, Hendrix displayed lyrical and musical ability that completely immersed his listeners in song. For me, Purple Haze is a masterpiece in all aspects. It conveys a dramatic sense of dislocation in its lyrics, yet overtly indicated its composer with intense use of the 'Hendrix chord'. This is music that is exciting, engulfing and well-structured down to the technicality of the trademark solos. "The music of Jimi Hendrix has played a role of undeniable influence in my life. Hendrix have taught me and countless others that music is more than an aural experience. It's something that transcends the four minutes of a single song and has the potential to become a statement accepted by generations to come. "It is my belief that Hendrix is far more than the greatest guitar player to have walked our planet. He is the town crier for a free generation and a direct insight into a time long lost."